So if, like me, you’ve been getting a bit sick of my lunch boxes being salad after salad, here’s a delightfully refreshing change. Sometimes (particularly in this cold, wet, vile British weather) you just want something a bit more substantial for your lunch. 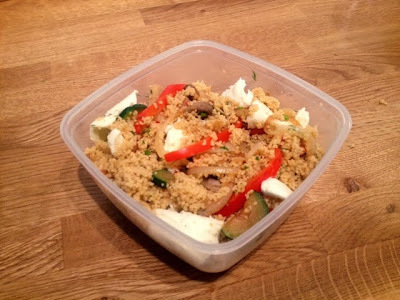 I’ve found that cous cous can be a little bit of a love or hate food, I know some people that can’t stand the stuff. I, however, think it’s a great, less stodgy, alternative to having rice or pasta for your lunch. It’s really good at absorbing flavours as well which means you can do a variety of different things with it, plus it requires next to no cooking. Covered with boiling water from the kettle, it’ll absorb all the liquid and be ready to eat in minutes. I buy the larger packets of plain cous cous, as opposed to the more ‘instant’ ready flavoured varieties you can get, so I always find it’s helpful to add stock and/or herbs and spices to give it a bit of help. You can eat this cold or heat it up in a microwave if you’re lucky enough to have that facility at work. 2. 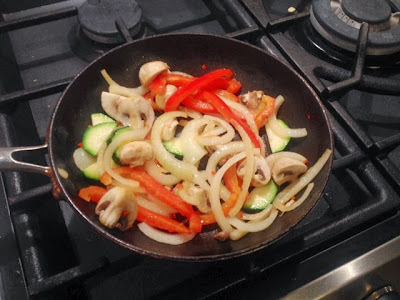 Meanwhile gently fry your onion, chilli, courgette, pepper and mushrooms until cooked but not so much that they go soft and mushy. 3. 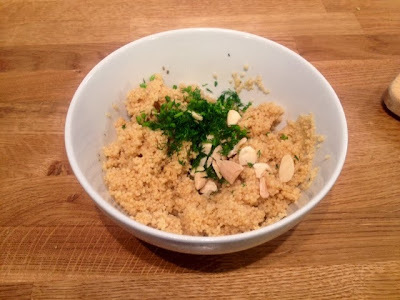 In a bowl crumble the stock cube into the dry couscous and add the paprika and dried coriander. Mix well. 4. Cover your cous cous with boiling water from the kettle until the water reaches approx 1-1.5cm above the level of the cous cous. Stir thoroughly and leave to soak. 5. When all the water is absorbed season with salt and pepper and add the fresh herbs and almonds and mix through. 6. 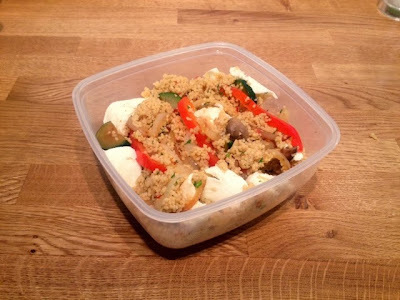 Mix together with the veg and when cooled tear your mozzarella into chunks and distribute evenly through.